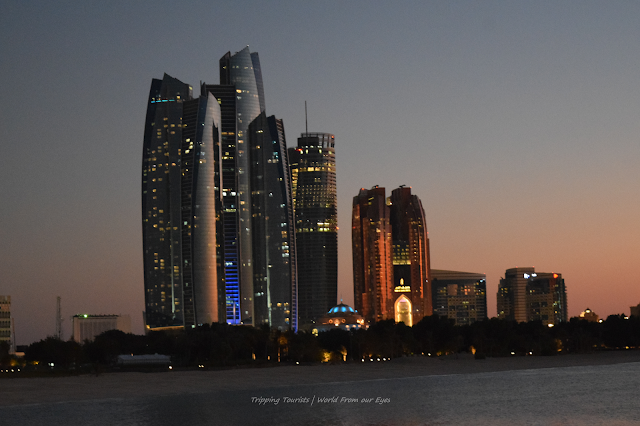 Abu Dhabi, the capital city of the United Arab Emirates is not a continuous piece of land but a collation of islands brought together to provide an administration center for the country. However, in today's world, it is difficult for any major metropolitan to remain just an administration center - it has to grow into a business hub and tourist destination. So has Abu Dhabi grown over years and the development of city seems to occur one island at a time. While the primary island is abuzz with government offices and some business centers coming up, surrounding islands have developed with a specific theme in the backdrop. Marina Island is one such island which is no less than a village in itself. The village built on a stand-alone island facility is house to a happening culture round the clock where it offers various activities and sites. 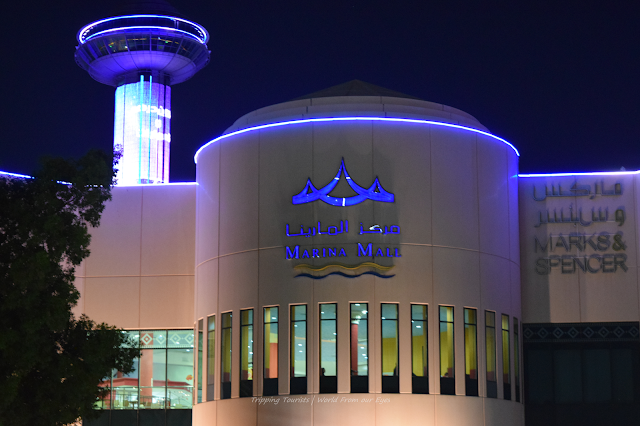 While the Marina Mall is the center stone of the island, it is surrounded by many other activities. 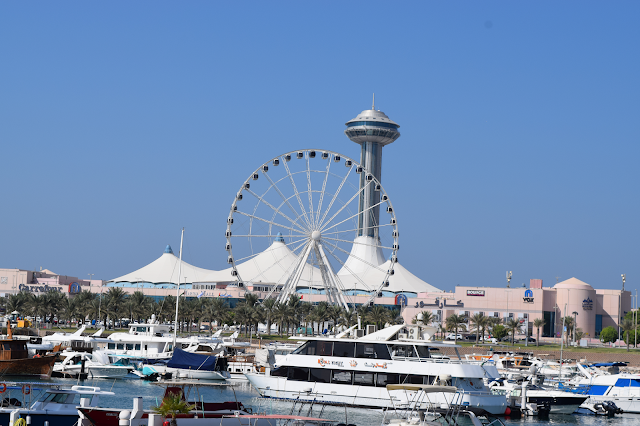 The marina eye is one of the most iconic sights from Corniche across the island. Then there is the Heritage Village where visitors get insights into the life of artisans and glimpse of how the handiwork of these hard working people creates marvelous pieces of art, textile, and decoratives. 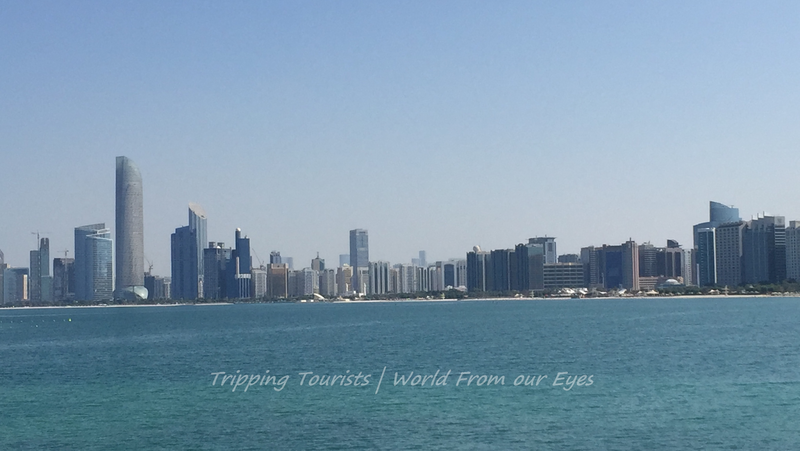 We spent an entire weekend exploring the various sites on the island and also taking up the Dhow cruise across the Persian Gulf. Here are key sites and our experience going through them. The mall is a landmark for the city and a tourist spot in itself occupying the center stage at the island. All other sites on Marina Island have been build around this mall and complement a visit to it. 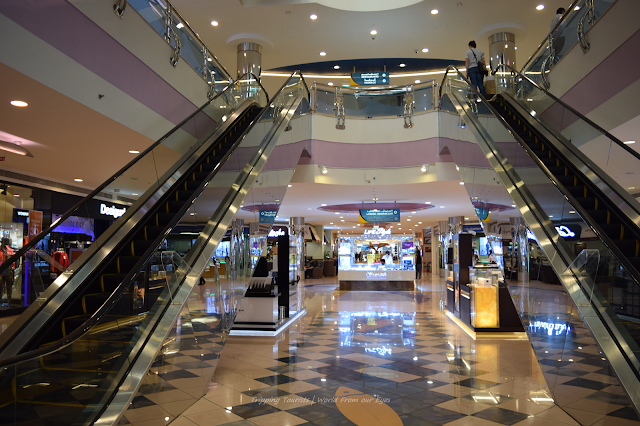 The mall is house to various international brands as one would expect but that is not what makes it a unique offering. The mall offers a 100-meter high viewing platform - Sky Tower - which provides a panoramic view around the city and the gulf across. The top of the Sky Tower features a restaurant which offers a 360-degrees viewing platform for its guests. There is no entry charge to the restaurant and hence tourists can probably take a peek inside the restaurant and enjoy the view across the city for free, but a coffee and snack - which comes at a pretty high premium - during an evening hour may be worth the investment too. The mall also offers a huge children activity area including the BOUNCE - a world where the wall becomes the floor, a slam-dunk is within your grasp and the rules of gravity no longer apply. The rides or bounces are really an attraction for children of all ages and we observed kids trying various acrobatics and jumps across various rides. There are numerous cafes and restaurants along with a Carrefour Store for your grocery needs. This is also a good place to pick souvenirs for friends and family back home – dates of all kinds, chocolates or other memorabilia like key chains. It is also a place to hang out with friends over the weekend and frequently hosts various shows within its premises. We got a chance to catch up on a show with World Got Talent artists - one mimicking various sounds of nature while other playing over a tightrope as if it was a dance floor. Right outside the Marina Mall is the eye-catching giant wheel which provides scenic views of the Corniche and the Gulf waters. The electrically operated wheel offers cabins for passengers and takes them on the vertical ride of the city. 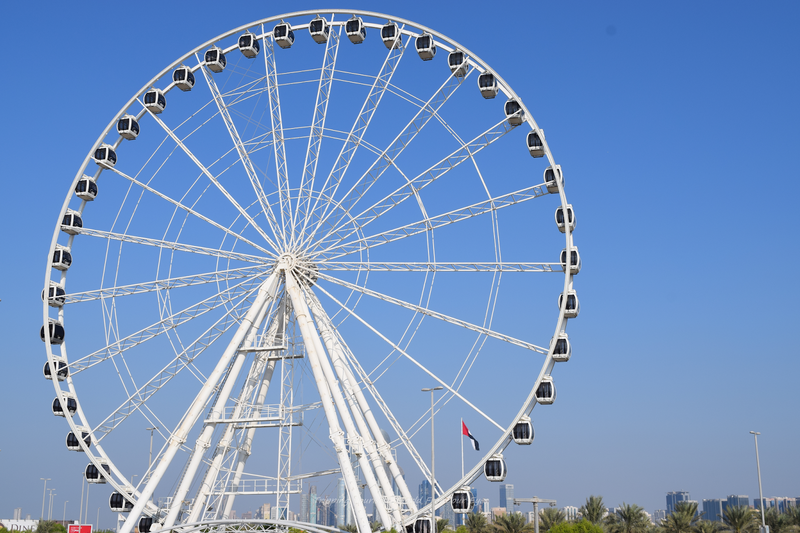 The Marina Eye observation wheel has 42 capsules, as well as a select number of luxurious VIP capsules for those wanting to take the ride to 'new heights'. 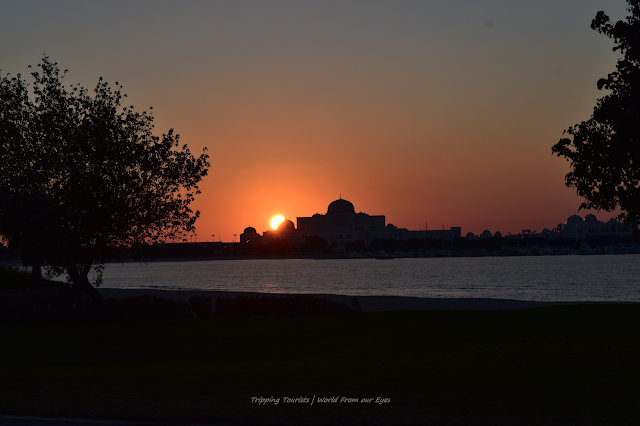 While the ride is available almost through the entire day, the best time to take it up is during the twilight - the time when the sun is easing its plight and is planning to retire for the day. 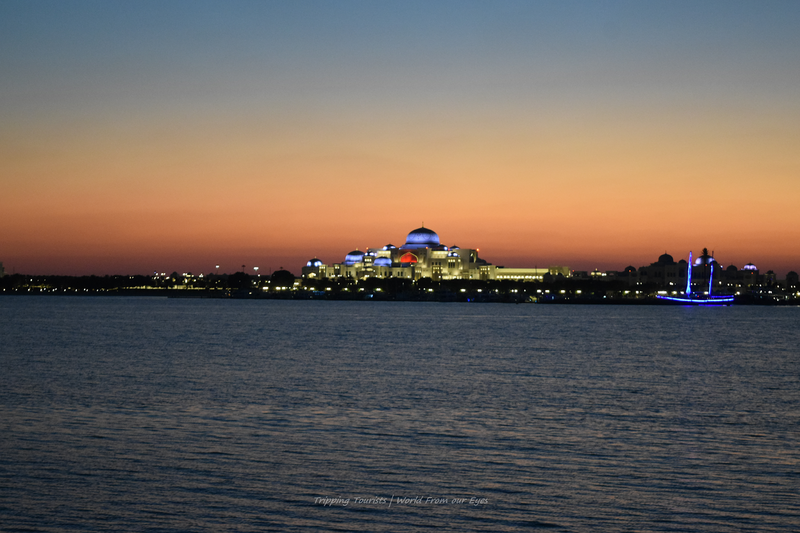 The reddening sky shading the skyscrapers across the Corniche is a site worth putting an effort for. I would say the idle time is to board around 5:30 PM on a winter evening and slightly later on a summer and stay ready to take up some of the wonderful pictures you may want to. As we have already covered, the village is situated on an island and is connected to the main Abu Dhabi Island through a wide road bridge which provides seamless connectivity to between the two land bodies. 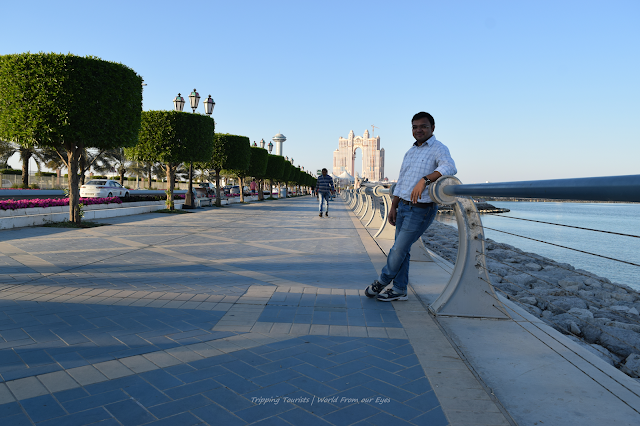 However, the authorities did use a wise foresight and developed broad pathways on both sides of the roads to allow people to stroll across the bridge and enjoy nature in its true raw form. The walkway is abuzz with activities during morning and evening hours with people jogging, walking or relaxing on one of the many benches facing the water. Towards the Marina end of the walkway, beautiful gardens have been manicured to provide for an activity area and structures have been erected to keep kids engaged. The area is definitely an attraction if you are looking for a calm place away from the hustle of city with views of the city’s skyline. Further, across the roads views simply become better as the day ends and sun prepares to set across the horizon. 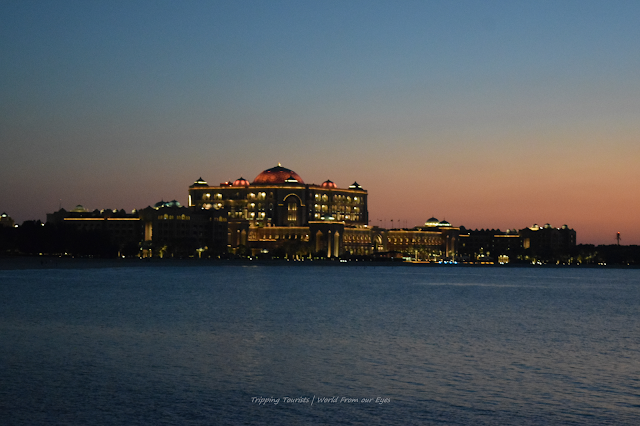 As the sun descends, the view of the Emirates Palace Hotel – the one with a gold ATM – and the Presidential Palace is heart catching. 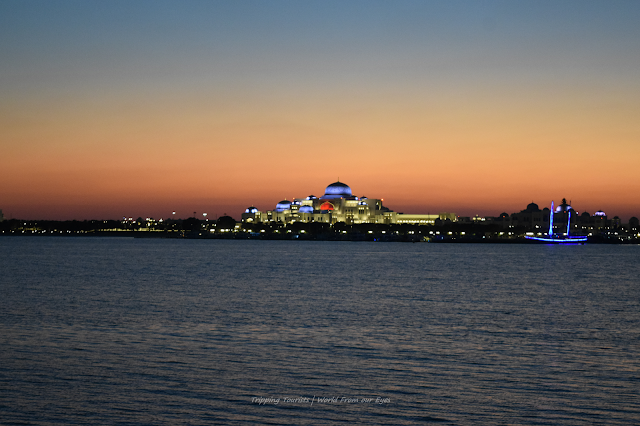 After the sunset, the two buildings glow in the darkness and the meticulous lighting on them shines like a star in the sky. Located on the far end of the island, this small village set up mimics traditional village set up of the Arab world. A 10-15 minute walk from the Marina Mall, the village is the best raw depiction of a rural scene one would find within an urban environment. A glimpse into the life of deft artisans at work creating marvelous handicrafts is what this place offers to tourists. The showcase of traditional art and craft is designed after an old oasis village with gardens and huts where age old craft is in the making. Visitors get a glimpse of how these masterpieces are created and the effort that goes into their creation. The craftsmen in the workshops are photo friendly and would let the visitors try a hand at the crafts. 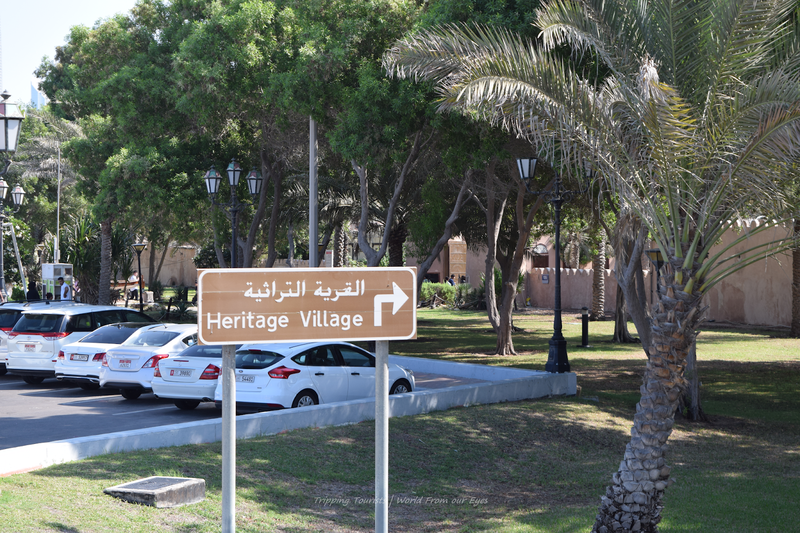 The village is a reconstruction of the village architecture with fishing harbors, mud huts, and tents which bring the Emirates past live for tourists. Concrete pathways finding their way between greenery and gardens take tourists on a ride into the history and rural life. Lifesize exhibits and artifacts of traditional instruments/equipment complement the theme of the village. In all this is one big open museum housed within the natural environment. 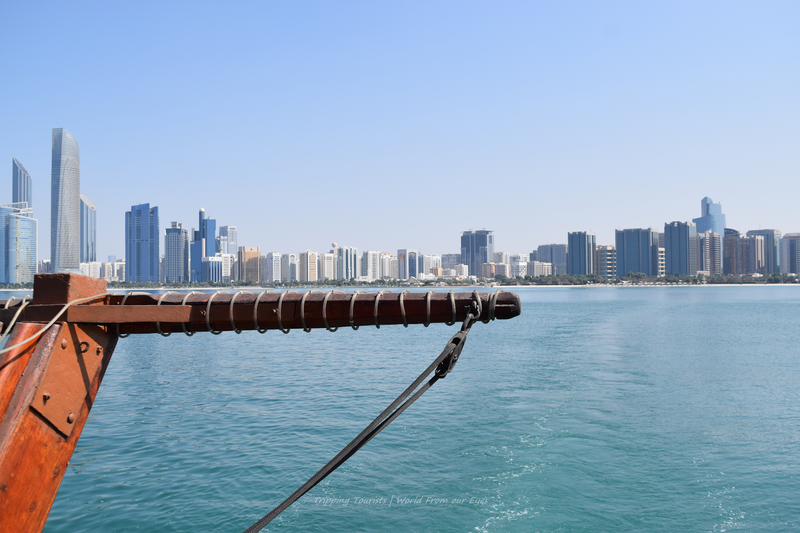 The village also is the house for the Emirates Water Sports Club which allows tourists to hire a boat and enjoy time over the waves of the Persian Gulf. One could seek away to one of the numerous islands using the available facilities - all you need to do is appear here and negotiate with one of the boat owners or drivers. There are also regular cruises conducted for tourists - most onboard Dhows or traditional wooden cruises. There are sightseeing tours, dinner cruise and other special party trips that visitors could choose from. 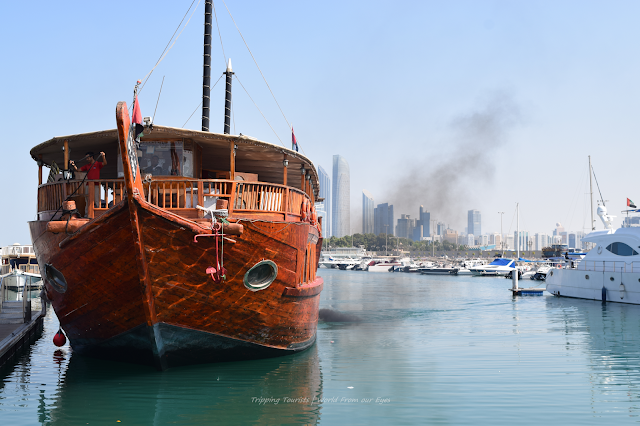 We took a lunch-time Dhow Cruise from the jetty to experience a ride in this traditional water vessel. The Dhow cruise takes you along the Corniche coastline and showcases the skyscrapers of the city along with the activities on the beach. The hour or two-hour long ride depending on the one you have chosen, you could witness the life of this city as it happens while on the water waves. On our travel, the vessel arrived from its previous round and the boarding was smooth as we settled on our seats. Chairs are distributed all around – some with the center tables along the periphery and some stand alone. The same vessel is used for dinner cruise too so you would find some buffet provisions in place. The ride is exciting and you get to view some good scenes but it is nothing out of ordinary compared to what you would expect. Overall, the island is a great place to unwind and spend time during a weekend and have some fun while at it. A grocery shopping visit can be clubbed with some quick leisure and take up some distraction. Take a walk, cycle or just sit by one of the benches and absorb the evening sun while reflecting on life is something we would love to do here!